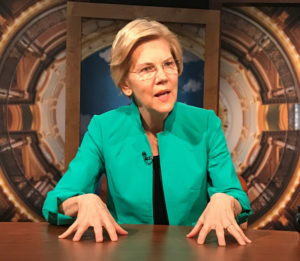 Eilzabeth Warren on Iowa Public TV. Democratic candidate Elizabeth Warren today said if she’s elected president, she would use anti-trust laws to break up what she calls “the giants” in the agricultural sector. Warren said due to massive mergers, farmers are left with fewer options for selling their grain and livestock — and fewer choices when it comes to buying seeds and farm chemicals. Warren, a U.S. Senator from Massachusetts, is among the handful of candidates who will appear tomorrow at the Heartland Forum in Storm Lake to discuss ag-related issues. During taping of the “Iowa Press” program that airs tonight on Iowa Public Television, Warren said farmers can play a key role in “fighting back” against climate change. The flooding in southwest Iowa illustrates the urgency surrounding climate change, according to Warren. Another presidential candidate will meet with southwest Iowa flood victims in Pacific Junction this afternoon and tour the flooded northwest Iowa community of Hornick early Saturday morning. Minnesota Senator Amy Klobuchard is proposing a trillion dollar infrastructure plan that would make investments in rural broadband as well as what Klobuchar calls “climate smart” infrastructure.